I've been working on a few new items for the shop and I'm hoping that by the end of the month I will have them all listed on Etsy and posted on the Quaintly Amusing website! I did want to share one new item that I will list this weekend, clear cupcake favors! 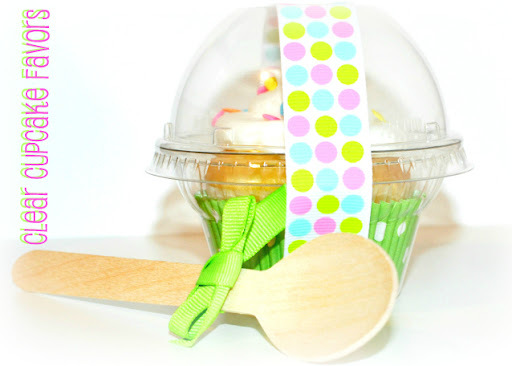 Each favor will come with a cupcake cup, a lid and a super cute wooden spoon. You will also be able to add cupcake liners and ribbon to your order. Here's a sneak peek! Those are super cute! I will definetely check those out! Thank you Muriel! I will have them up this weekend.